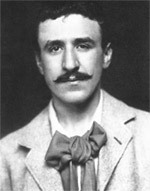 Although universally renowned for his architecturally famous buildings, Charles Rennie Mackintosh took great pains to ensure that the interiors reflected the simplistic styles of the exteriors. Concerned with the dramatic effects that light could cast in a room setting, Charles Rennie Mackintosh tended to use white or natural muslin as screens at the windows to diffuse natural daylight. He shocked the Victorians by painting his rooms white but colour was also used to effect with small stencils of colour in glass or enamel. Some rooms, noteably dining rooms, were dark and moody and again made use of stencils. Towards the end of his career, between 1915 and 1923, Charles Rennie Mackintosh supplemented his dwindling income by designing fabrics, with patterns based on stylized flowers and natural forms, such as roses, tulips, chrysanthemums, dahlias and tobacco flowers. He also designed more abstract motifs, vibrant patterns that herald the start of Art Deco.